I estimate that I’ve been loaned around $8 million worth of vehicles by car companies to review. These are called “press cars” and the total cost of delivering these vehicles to me is somewhere in the low six-figures and I’ve done about five figures’ worth of damage to them. How does giving me a free car make sense to automakers? How is this a real thing? People find out I get Porsches and Jaguars and Cadillacs and the occasional exotic like an Aston Martin or Lamborghini and it’s all they want to talk about. The idea of the “press car” itself seems like an absurd notion, but it makes some sense when you consider that a car is not a laptop or a meal at a restaurant and that the logistical challenge of getting cars as a journalist or giving out cars as an automaker are great. Most of the time I’m writing articles and not driving cars, but about once a week someone will deliver me a car and I’ll drive it anywhere from 15 to 200 miles, depending on the car and the week, before I either return it or replace it with something else. Sure, it is a small part of my job, but it is disproportionally a topic of conversation for me for the same reason dunks feature more prominently in basketball highlight reels than free throws. And yet, when a couple of reporters who don’t cover cars inquired as to the logic of it all I realized that, like most auto journalists, I couldn’t give them that much information. I’m not naive, I have a basic understanding of where the cars come from and go, but that’s mostly knowledge I use to my advantage get more or better cars. For all of the millions of dollars that change hands to make this happen — millions spent ostensibly on reporters — there’s very little reporting on how it actually happens. So, for the purpose of explaining this to myself and to you, the readers and consumers of this information, I interviewed numerous parties involved in the car industry to paint a picture of how and why this is a thing that exists at all. I’ve spoken with people involved at nearly every step of this process and I’ve anonymized and generalized the responses so as to give a broad sense of how the system operates and not a specific view of how one company works (there are competitive issues at play and I wanted honest answers). For all the money it costs it actually makes sense for the automakers to do it. It is nearly impossible to review cars successfully without press cars existing. I am a huge jackass, but there are bigger jackasses. We’ll say the company is a British automaker named Frazer and the car is a sporty grand tourer called the Cheetah. The first step is that a communications person at Frazer thinks about who is going to drive the car and what sort of options journalists might like. This often leads to cars having as many options as possible checked off at MSRPs well above what any rational human being would pay – or what Porsche calls “average transaction price.” Journalists are jaded and strange and appreciate white cars with black wheels and brown interiors. The Frazer PR person might be extra clever and know the car is going to be in the New York area during the winter so she orders it with seat heaters and a steering wheel warmer. The one going to the Atlanta won’t get those options. She may also do something weird, like order every premium feature except for a sunroof. This is because if the Cheetah is going to do any performance or fuel economy testing the 250 pounds of heft is going to be an issue. This specially ordered Cheetah rolls off the assembly line in Bratislava where it’s made (Slovakia is the new Detroit) and is immediately intercepted by a Frazer employee whose job is to make sure the press cars are perfect. The Alcantara headliner might have a snag or the veneer on the wood interior might not be up-to-snuff and the various parts might be swapped out. Frazer is on the high-end and the Cheetah is a new model so they take extra care. Many other automakers aren’t as particular. The Europeans tend to have smaller fleets than the Japanese or Americans and take special care, although this varies from company to company. The Cheetah is then sent to a port and shipped to New Jersey where it’s given the once over in a Pre-Delivery Inspection (PDI) to make sure nothing happened in transit. The plastic protective covering is removed and a Frazer employee drives it back to Frazer’s North American HQ in Delaware where select employees put the first few hundred “break-in miles” on the sporty car to make sure there are no issues that wouldn’t be caught in PDI like an alignment issue that only is exhibited at the kinds of high speeds journos take press cars. Once again, Frazer’s PR team is very particular. Some companies will pay someone else to do the break-in miles or won’t do break-in miles at all. Because the economics and logistics of managing a dozen Cheetah press cars in the major media markets is challenging, Frazer outsources this job to a fleet operator. Almost every major car company — from Lamborghini up to General Motors — uses a fleet company to deal with journalists, with maintaing the cars, and the moving of vehicles from point A to point B. They are the gatekeepers and it’s always nice to have them on your side. ESI and DriveShop (formerly STI) are the biggest operators, but there are a number of fleet operators in different markets who have accounts. Some companies only go with one major operator nationwide while others use different operators in different places. From the perspective of the journalist they’re all basically the same. These fleet companies make their money delivering the cars, caring for them, and maintaining relationships with journalists. Increasingly, they offer services such as assistance with putting on events or logistics. The sense I get is that the journalists are like gasoline at a service station in that it’s a necessity to get the business but generally the least profitable part of it. Some get a flat fee for deliveries (though they don’t like this) and some get paid over a certain milage. An ideal trip for a fleet company who isn’t getting a flat fee is delivering a car a few hundred miles because the profit on that trip becomes higher. The Cheetah is shipped to New York and when it arrives the fleet operator gets a tour and specific items on the car that might be important for them to know — like a new type of push button transmission — will be reviewed. The fleet operator, who I will call EST&M, then takes the car and schedules out who will get it. Frazer’s discerning attitude towards their cars also extends towards journalists and the scheduler at EST&M will know that the 19-year-old beat reporter from the Enis Daily Examiner is a persona non grata only worthy of hatchbacks. People who write for national magazines, premiere blogs, and lifestyle publications will be the only recipients. Depending on the automaker and the region, each car will be driven for weeklong periods by roughly 10-to-15 journalists. Some cars go to more people, some to fewer, but 15 is around average. The first trip of the Cheetah goes to a well-connected lifestyle journalist who gets every car first. Before the car goes out the delivery driver will make sure to detail the Cheetah, vacuum the carpet, check the levels of the audio system and do a visible check to assure there are no issues. The driver will then drive through the Holland Tunnel into New York and find the gas station nearest to where the journalist lives so that he can deliver it with the maximum amount of fuel. After a quick chat and a signature the driver will then hand the keys over, hop on a train, and head back to do it all over again. A week later he, or someone else, will pick the car up. This journalist is pretty courteous so the car will be clean and have at least half a tank of gas. The car will also go to a dealer after every visit to make sure it’s fine, although that’s because this is an important car. Not every vehicle gets this treatment. This will be repeated multiple times with a few variations. One journalist lives in upstate New York so the driver will go with a chase vehicle and spend nine hours (4.5 hours each way) on the road and another 30 minutes at a car wash near the journalist’s home to deliver that one vehicle. This particular journalist is a cheapskate and barely leaves the Cheetah with enough fuel to make it to the gas station. Journalists will curb three different wheels over the course of the loans and, because they’re polished chrome, they’ll just be chucked instead of repaired. Another will do burnouts for all the neighbors and wear the rear tires down. Halfway through the car’s tour a PR person at Frazer will notice a lot of comments about “a $150,000 car not coming with satellite radio” and will send the car to a dealer to get that fixed. The car will go to the dealer multiple times for updates and other issues that tend to follow brand new cars, as well as to get an alignment after a journalist bangs it into too many potholes. Because this is a high-demand model it’ll either be in transit, being cleaned, or being serviced when it’s not in a journalist’s hands. Eventually, it’ll arrive on my doorstep and I’ll proceed to park it in a garage and forget it about it for a few days before I remember that I didn’t get any photos and quickly run out to the Rockaways for some driving time and a few quick snaps. Once the vehicles reaches 9,800 miles there are no more loans scheduled and it’s taken to a wholesale auction where it’s resold without the buyer being told that it was used as an abused rental car by ungrateful journalists. Most press cars end their lives at around 9,500 miles so that they can be sold with under 10,000 miles, which is a big deal. No two press cars live the same life and therefore no two press cars cost the same, but in my conversations with a variety of people in the industry I’ve been able to piece together a general sense of the costs. While press cars are generally the largest portion of an automaker’s communication budget, an automaker usually only eats the actual cost of building the car and isn’t paying to buy it from a dealer, thus there’s an immediate savings. If the press car is a high-end luxury sedan with high margins this might be a large savings. If it’s an econobox the savings may be tiny. Assuming there’s no significant damage, an automaker will recoup about 70% of the cost of building the car when they sell it at wholesale, but this varies by car and condition. For example, if a car MSRPs at $150,000 but only costs $100,000 to make and sells for $70,000 at the end of the loan, the total car cost for the automaker is about $30,000. When you factor in gas, delivery costs, the constant cleaning, and the fees from the fleet operator it’s safe to assume somewhere between $400 and $600 on average. If the delivery is within a certain number of miles of where the fleet is based (i.e. Los Angeles to Santa Monica) the costs might be lower than, say, from Los Angeles to Barstow. The cost of replacing the wheels, doing the updates, and replacing the tires on a car might come out to about $5,000. If the if the car is a minivan that’s been on the market for a while this cost will probably be much lower. None of the damage will be reported to an insurance company because that lowers the resell value and, on a higher end vehicle, it’s cheaper to just replace parts. 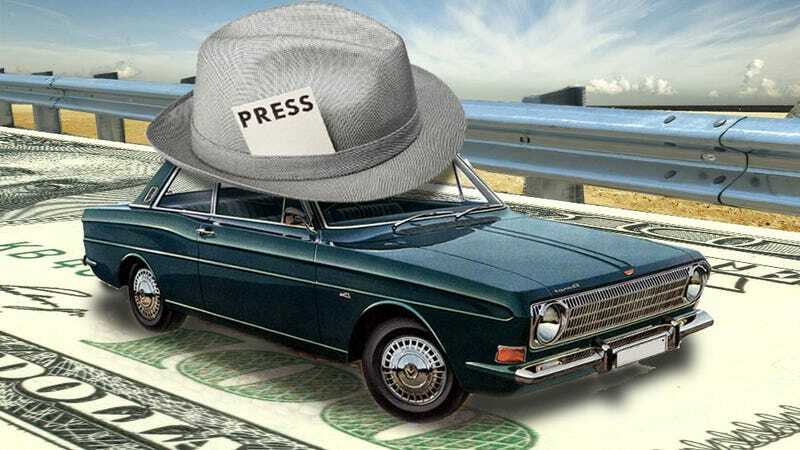 Therefore, the total cost for the car mentioned above that MSRPs at $150,000 ends up being something like $42,500 to get it to 15 journalists, or about $2,800 per journalist. This is just a hypothetical, though, and many cars will cost much less and some will cost automakers a lot more. Another way to look at the costs is to look at people who try to reckon with the obvious conflict-of-interest getting a free car represents. The New York Times “Autos” section for many years paid automakers a “rental fee’” for the cars they were given that was based on the Avis corporate rate but capped at $600 a week. While that doesn’t entirely cover the full costs involved with a press car that seems to come close to what it costs the automaker to provide a vehicle. Still, a copy of the old guidelines for NYT Autos shows the editors there trying to maintain a policy that dampens the perk that is a free car, specifically imploring writers to not use the cars as substitutes for personal transportation – a thing most auto journalists giddily do. The most conscientious of all automotive publications is Consumer Reports, who spends about $2.7 million a year outright buying approximately 70 test vehicles. They also buy the cars secretly so that automakers don’t tweak the cars before they’re delivered to the Consumer Reports auto test facility in Connecticut. But, it may surprise you to know, that even CR gets press cars. This speaks to the logistical challenges of the press car universe. Its’ difficult for CR to buy every trim level of every car (the Fusion comes in I4, I4 turbo, 2.0 Turbo, Hybrid, Plug-in Hybrid, and AWD for instance) and they’re still reporters like the rest of us and thus they don’t like getting scooped while they wait for a popular car to finally arrive at the dealership. It’s better for them to get a press car and get a short story up rather than not have any information for a few months. Again, that’s a pretty great deal if they’re getting an Audi for ten days, but it’s better than most journalists do and they will replace a tire or pay for any damage they make to press cars. Jalopnik, for instance, is happy to not pay when we damage press cars (although that’s usually a rare occurrence). While Consumer Reports does make some of their money back when they sell the cars after testing, the millions of dollars spent reviewing vehicles is something few outlets can match. Consumer Reports and The New York Times are the exception in that they pay for press cars, but they still take them and automakers are still happy to provide them. Why? From a PR standpoint, the alternatives to press cars are much much worse. If all journalists did was pick up random cars from dealerships there’s no telling what options the cars would have or the condition they’d be in. A rental car would be even worse. A press car gives an automaker a lot of control over what a journalist experiences. For instance, a PR manager for a major brand once admitted to me that he was aware of all the loans of that brand’s cars that went out and would make sure a crossover he knew a specific journalist wouldn’t like was never available and would instead have the fleet operator offer a sportier option in its place. Beyond the control automakers get, there’s also the value of exposure. In the corporate world they call all of this “earned media,” in that it’s media they didn’t have to pay millions to get, as opposed to expensive advertising. Sure, they don’t entirely get to have sway over what gets written, but more people will read a post or an article than will look an advertisement. A half-page ad in the national edition of The Wall Street Journal, for instance, is about $98,000 on the cheap end, and the minimum it costs to advertise on this website is $25,000. Granted, we’re at the top end of the market, and the car will go to people who work for smaller publications with cheaper advertising. It’s a numbers game, and it only takes a couple of write-ups at one or two large publications to make up the total cost of building, buying, and operating a press car. That makes everything else a press car gets in tweets, Facebook posts, articles, and video gravy for the automaker. In fact, this kind of coverage is so valuable that the automakers will turn around and pay the publications to quote accolades from the reviews in their commercials. Therefore, a journalist could end up getting a free car for a week and then his magazine could end up getting a few thousand dollars on top of that for the positive things they said about the car. Jalopnik has received money to grant permission to automakers to quote our reviews in a TV commercial, although the writers are generally unaware of this until the ad comes out and don’t directly receive this money. You may have seen the Cadillac XTS ad that quoted Jalopnik that ran during March Madness a couple of years ago, although that quote wasn’t from a review but from a post about the car’s debut. At the beginning of this piece I said I’ve received about $8 million (MSRP) in press cars over the nearly eight years I’ve done this. That’s a guess based on a review of the vehicles I’ve had, and is inflated by a few interesting cars I’ve driven (a Rolls-Royce Phantom Drophead Coupe at $550,000, for instance). On average, I’ve been loaned 25 cars a year for the last seven years, or about 175 cars in total, with an average MSRP of around $45,000. That’s roughly $7.9 million worth of cars and I’m not counting the $2.35 million Bugatti Veyron Vitesse I was loaned for a few hours or any of the cars I’ve had on press trips. At the average of $500 per delivery that’s $87,500, but when I was living in Houston and Virginia I was on the more expensive end of the spectrum so I think $600 is a fairer estimate, or around $105,000. I once dented the side of a Nissan Frontier in an off-road excursion, I caved in the hood of a Jeep Wrangler, and an Infiniti G37 in my care was hit while parked on the street. I’ve also done unspeakable things to paint and wheels. All in, $10,000 worth of damage is a lowball guess and I wouldn’t be shocked if the number was closer to $25,000. I definitely get cars when I have specific errands, although I usually tell the fleet person the reason why I need a vehicle. I try to be clean, but there’s some sand in the bottom of the convertible I have this week and there’s a chance I forget to clean it out before it goes back. I’ve never given a car back without at least half a tank of gas in the car, but I also don’t always go fill up the tank before I return it even though I always get a car with a full tank. Unless the car is over a certain amount of money (about $50,000) I often park it on the street. Amazingly, according to people in the industry, I’m better than average. There are people who rely on these cars as their only means of transportation. There are people who have, allegedly, siphoned gas out of press cars before returning them. There are people who manage to curb every wheel every time and not mention it. So am I worth it? I must be, because I still get press cars. There was a time when we had to prove we were worthy and responsible but, once you reach a certain position of influence with a certain readership, it becomes a lot easier. For all the trouble I cause people – and I tend to cause a lot of PR people a lot of headaches – most of them have determined that the potential reward is worth the potential risk. And this leads me to a calculation I don’t want to make: Is it worth it to me? We don’t have Consumer Reports money and, while one day we could pay to “rent” cars, even that isn’t a true 1:1 calculation and you still have to be friendly enough with the fleet operators and the PR people to get access. I love driving different cars. I love having access to press cars. It is definitely a benefit for the site and the readership that I have access to cars and I like to think that I don’t let it stop me from writing anything that I don’t want to write, but if automakers think I’m a safe bet it’s hard to feel dangerous. Armed with this information, it’s also important for you as the reader to realize that most of the cars we drive are at least a little different from the cars you’re going to get. It’s important to realize that, unless otherwise stated, that reviewers are getting a benefit from automakers, even if it’s a benefit they might need to do their job. There’s no implicit reason why you shouldn’t trust a review of a press car, and the system exists for a reason, but you’ll be a better consumer of news if you realize that when we’re gloating about how perfect and wonderful a car we just drove was that there’s an entire system in place to make sure the car is perfect and wonderful when we get it. Business Time is Jalopnik head honcho Matt Hardigree’s regular column about the business of building and selling cars. He can be reached at at matt@jalopnik.com.